Bird hunting season is in full swing here in Oregon, with opportunities to hunt upland birds (grouse, quail, pheasant, chukar, hungarian partridge) and waterfowl (ducks and geese). My elk hunting buddy, Brandon, is a die hard upland bird hunter and when he invited me on a hunt last week, I jumped in the truck and we headed east. 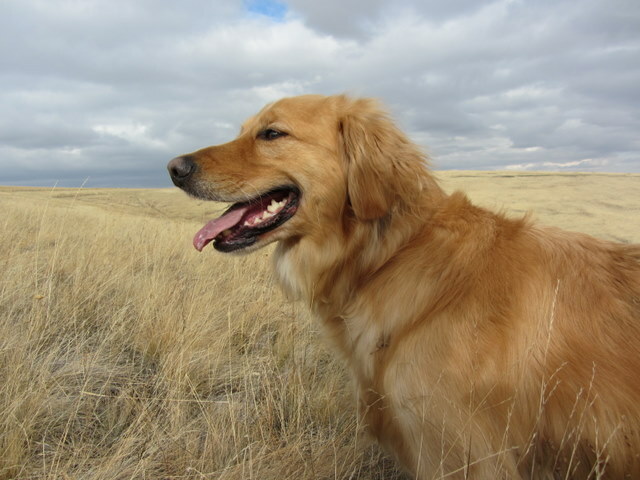 I’d only been upland hunting once before and my golden retriever, Banjo, had never been. Banjo is trained for waterfowl hunting, where it’s important for the dog to sit patiently next to the shooter until released to retrieve the fallen birds. 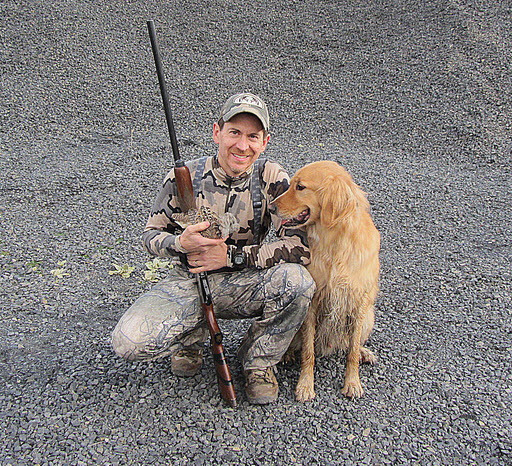 In upland hunting, the gundog’s job is to find the birds, not just retrieve them. Upland hunting dogs fall into one of three general categories: pointers, flushers, and retrievers. Pointing dogs run way out ahead of the hunter searching for birds. When a pointer locates birds, the dog stands still and points to them until the hunter arrives and flushes the birds into the air, hopefully shooting a bird or three in the process. Flushing dogs typically don’t point. They zigzag back and forth “quartering” the field, staying close to the hunter and then flushing the birds as soon as they find them. 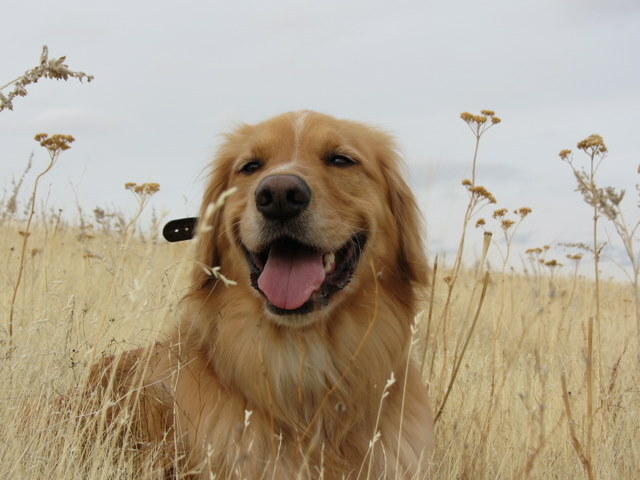 Banjo is a retriever. He doesn’t point and hasn’t been trained to quarter, but he is “birdy” and naturally likes to run up birds when he comes across their scent. We parked the truck, geared up with shotguns and #6 shotshells, then headed up into the rolling hills on foot. The day was perfect: clear, cool and dry, with a gentle downhill breeze. 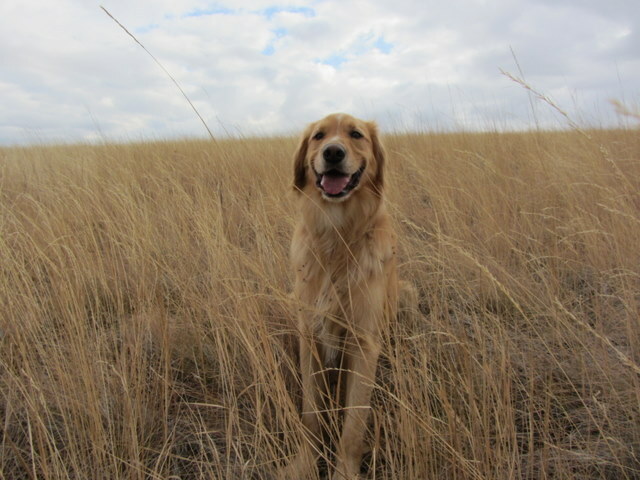 Brandon hiked the ridge with his pointer puppy, Bella, and me and Banjo walked the creek bottom. Five minutes from the truck, a covey of Hungarian Partridge flushed from the hillside, flying left to right in front of me. As if on auto-pilot, I swung my shotgun up, followed the birds, and planted the gun stock solidly below my cheekbone. I picked a bird and pulled the trigger. BOOM! I missed, but without hesitation, kept swinging the barrel left to right following the birds. BOOM! My second shot dropped a “hun” cleanly out of the sky, landing in the cheat grass on the far side of the ravine. Sweet! As soon as the birds flushed, Banjo stopped moving and watched, but he didn’t see the hun fall. I called him over to my side, sat him down, pointed him toward the fallen bird, and said, “Banjo!”, sending him over to find the bird. This is called a “blind retrieve” because the dog doesn’t know where the bird is. Banjo ran straight down the ravine, crossed the creek, and ran up the other side, ending up to the right of the bird. I whistled once and Banjo stopped, sat down, turned and looked at me for directions (just like he was trained to do). I motioned with my left arm, pointing to the left, away from my body and commanded, “Over!” Banjo ran to the left until I blew the whistle once more, stopping him below the bird. I raised my left hand straight up above my head and directed him with the command, “Back!” Banjo turned, ran up the hill, found the bird, picked it up, and I called him back with three short whistle blasts. Without hesitation, Banjo ran straight back, sat next to me, and held the bird in his mouth until I took it from him. Perfect! Me and Banjo have been practicing this type of “handling” for the past year and a half. It’s always great to bag a bird for the cooking pot, but the real satisfaction comes from working as a team. The dog has to trust the handler and believe that wherever the handler sends him, it will lead to something for the dog to retrieve. The handler also has to believe in the dog and let the dog work, trusting in the dog’s nose and ability to find the bird. It’s a true partnership and this type of teamwork forges a bond between man and dog that is something beautiful to watch and wonderful to be a part of. Banjo and I had a great day. 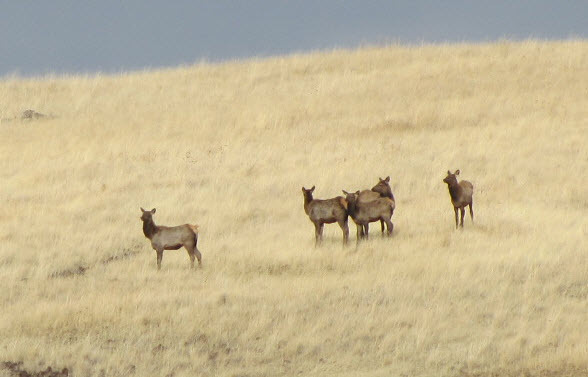 Along the way, we saw deer, elk, quail, pheasant, and a coyote. Banjo was having such a great time, he even decided to take a full body roll in a big pile of fresh cow manure. Just doesn’t get better than that! He was pretty well cleaned up by the end of the day after jumping in the creeks. By the end of our six hour hunt, we were both exhausted. 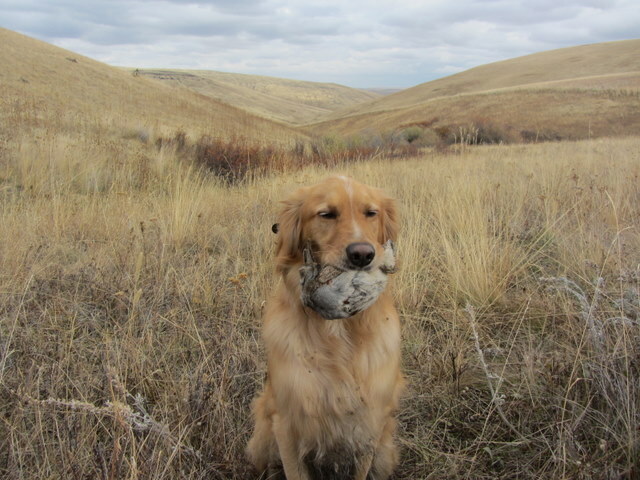 It was Banjo’s first upland hunt. We got to spend the day together, hunting, hiking, sharing lunch, and even went home with a bird for dinner. It just doesn’t get better than that. 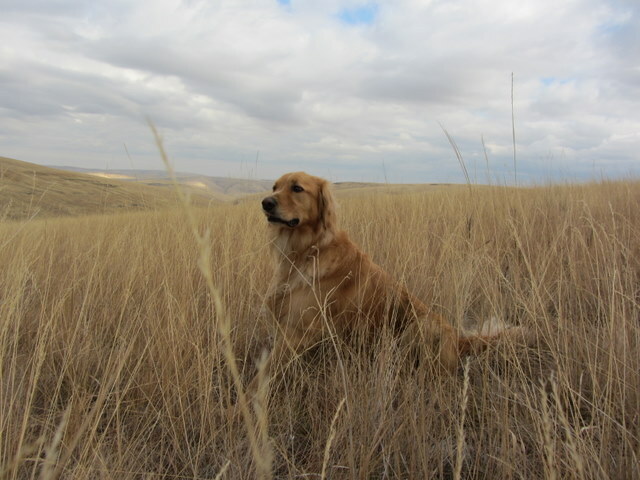 This entry was posted in Gun Dog, Hunting and tagged goathunter, golden retriever, Gun Dog, gundog, hun, hungarian partridge, Oregon bird hunting, upland, upland bird, upland bird hunt. Bookmark the permalink. Damn that dog is Cute! I’ll give ya $20 for him? I have the most handsome hunting team in the world!